Rock City got its start in the 1930s. Eight hundred barns were painted thusly, as advertising. ROCK CITY, Tenn. – A great battle was fought here. If you think I’m talking about the Chickamauga campaign of the Civil War or you’re thinking of the aboriginal Trail of Tears, you’re well on your way to an A in American history, but you fail this quiz. If you know that Rock City on Lookout Mountain is the site of the climactic battle in Neil Gaiman’s American Gods, you win. The audio book, read by George Guidall, has been our road-trip tale for a few months, and we finished it shortly before arriving in Atlanta. The House on the Rock also features prominently in American Gods, and we went there two years ago, so it made sense to bookend the story with a trip to Rock City. Fat Man’s Squeeze. Do not try this at home. We visited on the first cloudy day of our vacation. Also, it was Wednesday (Wow! Double points! ), so we didn’t have to share the park with too many people. Stone pathways lead you around and into the mountain. On a quiet, cloudy Wednesday, you won’t knock elbows with anyone else, which is a blessing, because there isn’t a lot of elbow room, especially if you walk through Fat Man Squeeze. It’s at least two storeys tall but only a foot and a half wide. And you wouldn’t want a group of schoolchildren underfoot while you’re going through the Goblin’s Underpass. The gnomes you’ll meet in American Gods. The 1,400-foot walking tour isn’t over. Across a swinging bridge is the attraction’s showcase: A 140-foot waterfall pouring from Lover’s Leap. 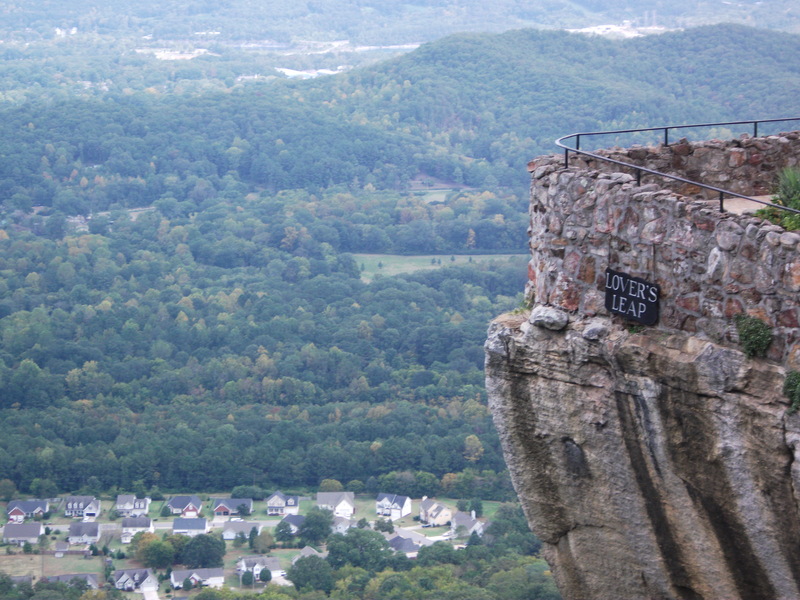 If you go on, to the edge of Lover’s Leap, you can see seven states: Tennessee, Kentucky, Virginia, South Carolina, North Carolina, Georgia and Alabama. You can picture a battle being fought here between the old gods and the new, a fight that was the climax of a crazy, two-man con. A place like Rock City is always great, but it’s wonderful with a story attached. Lover’s Leap. And what a leap it is. Previous Half the fun is getting there. Right?